Today we are putting it in reverse and getting ready to head back to Wisconsin for the next load. 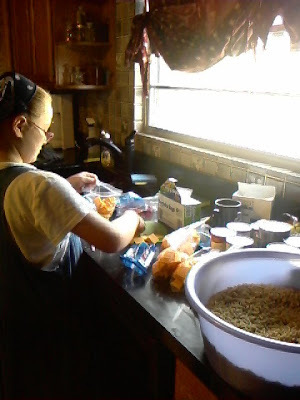 Bekah is getting things ready for a fun snack dinner on the bus tonight. The kids are strategically packing for about five days. It's a huge job! There is no clothes washer at the old house, as we brought it here, so we have to bring enough but not too much. Plus, house trash cans, rugs, brooms, kitchen items, can opener, bedding, linens, empty boxes that we can reuse, tools, all winter wear, including our pressure washed snowboots which were encased in Mississippi mud from the pre-move yardwork in the rain, etc. We are looking forward to a weekend trip with Daddy. He will have to head back in the pickup to St Louis for work Monday, and is bringing our queen box spring which does not fit in the bus, among other things. I think that is the only thing that we can't get into the bus. Lord willing, the rest of will follow back with a busload on Wednesday or so.